It has been several years since Miles said that now infamous line “If anyone orders Merlot, I’m leaving” in the 2004 film Sideways. Now, the varietal is starting to find its way back after sales spiraled downward for along time after the movie. Although Merlot is often used as a blending grape particularly with Cabernet Sauvignon (softens the Cabernet), there are several excellent Merlots being produced in France, California, Italy and Chile just to name a few locations. Merlot is produced in many different styles similar to Cabernet Sauvignon, from light and fruity to more of a big and fleshier (a wine that has body and tastes chewy or meaty) style with each having their merits and appropriate pairings. Merlot is generally softer and can be riper than Cabernet and tends to be less tannic. Being that it is softer, it can pair with a wide range of tomato-based Italian dishes and well as several different proteins, vegetables and cheeses. Some of the fruit characteristics of Merlot are black cherry, raspberry and plum just to name a few. The wine is usually aged in oak barrels were it picks up nuances of cedar, tobacco and vanilla. Below we will examine food pairings with light and fruiter Merlots as well as bigger and fleshier Merlots. Merlot pairs well with several different foods. Fruity merlots can pair well with red fruit such as cranberry sauce and salads that contain red fruit like a spinach and raspberry salad topped off with goat cheese. As mentioned above, pasta dishes with tomato-based sauces like chicken parmesan and dishes that include bacon or pancetta can work, like a bacon avocado pasta. Pizza with sausage and/or pepperoni can be outstanding with a fruitier Merlot as well as a big juicy hamburger particularly complimented with gruyere. As far as vegetables go, think Mediterranean. Grilled vegetables like peppers, zucchini and eggplant are winners to accompany a dish with the fruit from the Merlot accentuating the vegetables. A charcuterie plate to kickoff an evening will be perfect with the wine too. 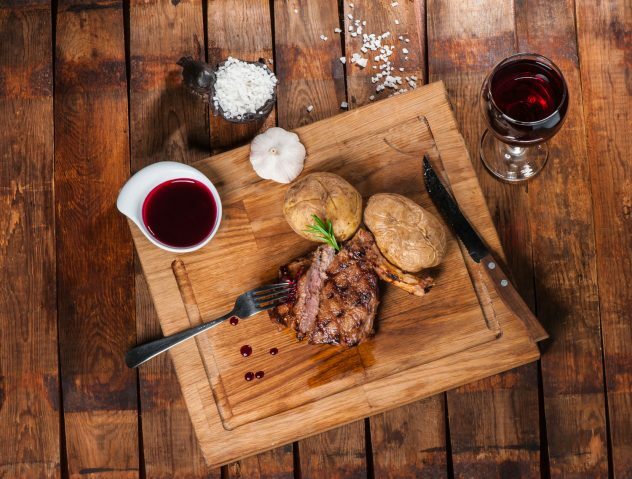 These merlots are quite versatile as well and many tend to pair with richly sauced dishes like a Merlot-based red wine reduction sauce or a barbecue sauce drizzled over pork chops. Did someone mention red meat? Bigger Merlots can basically stand up to anything a Cabernet Sauvignon can, for example rare-prepared bone-in ribeye. Also consider Beef Wellington with mushrooms, braised short ribs and lamb chops encrusted with cranberries, thyme and oregano are matches made in heaven. Mild to medium hard cheeses work well with this style of wine including Colby and Monterey Jack just to name a few. Although some might cringe, a rabbit casserole that has a fruity element like prunes is worth considering. Although Merlot is very versatile, there are a few possible no-no’s. Very spicy food in general will not work well with Merlot due to the spice overwhelming the flavors of the wine and fish in general is also usually not considered the beast pairing. Here the wine can overwhelm the fish.